The St Croix Ashby fireplace insert can be specified in two version: Pellet and cherry pit using the versa-grate and The Multi fuel version using the multi fuel grate which will burn pellets, corn, wheat, rye, cherry pits and distillers grain. Both versions use the same stove body. The St Croix Ashby will produce up to 40,000 btu. per hour and is rated to heat an area of 1,800 square feet. Because of the higher ash contents of other fuels, only the pellet version of the Ashby is EPA certified. Two convection fans are fitted which are capable of operating independently should one fail. The sixty pound hopper can be reduced in size to suit smaller fireplaces, (See Comments below). With a 60 lb. hopper, this fireplace insert can burn continuously on the low heat setting for forty eight hours without re-filling. The multi fuel version has an enlarged ash pan. Min. Heat Output 10,500 btu. Zero with optional thermostat. Automatic Ignition Yes for the pellet version, no for corn. Manual Ignition Yes, if needed using pellets. Corn burning version must be lit manually. Fuel Type Pellets and cherry pits can be used with the versa-grate system installed. Pellets, corn, wheat, rye, cherry pits and distillers grain can be burned with the multi-fuel burn system installed. Thermostat Compatible Yes, available as an option. Window Size 25 ins. by 10 ins. Rear Vent Height 6 ins. As the multi fuel burning version must be lit manually, it will not cycle on and off using a thermostat. An extension ash pan must be used with the multi fuel version because of the increased ash content of the fuels. This raises the height of the unit by four inches. The hopper height is adjustable to accommodate smaller fireplaces. Lowering the hopper will result in less capacity. Daily: Or more often if using high heat setting, clean the burn pot. Check the ash pan, clean the heat exchanger tubes, clean the glass. Weekly: Empty the ash pan, clean out air holes in the burn pot, clean the ash traps in the exhaust system. Monthly: Clean ash from behind the heat exchange baffle. Every two months: Check the exhaust venting and clean if necessary. Yearly: Remove all fuel, clean the burn pot, firebox, ash pan and ash traps. Clean the exhaust system, vacuum the fan area behind the firebox. Remove and clean the convection and combustion fans. 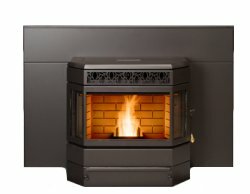 If you would like to leave a review of the St Croix Ashby pellet stove insert, please use the form on the contact page.